Tanks & Tablecloths: a collaborative, research-led artwork, mapping the ground shared by the military and the domestic. 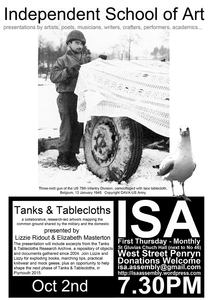 The presentation at the Independent School of Art, will include excepts from the Tanks & Tablecloths Research Archive, a repository of objects and documents gathered since 2004. Join Lizzy and Lizzie for exploding books, marching tips, practical knitwear and mock geese, plus an opportunity to help shape the next phase of Tanks & Tablecloths, in Plymouth 2015. Collectively run, the ISA is an active forum for critical discussion and practice. It was founded on the principle of free thinking against the backdrop of rising tuition fees for universities.